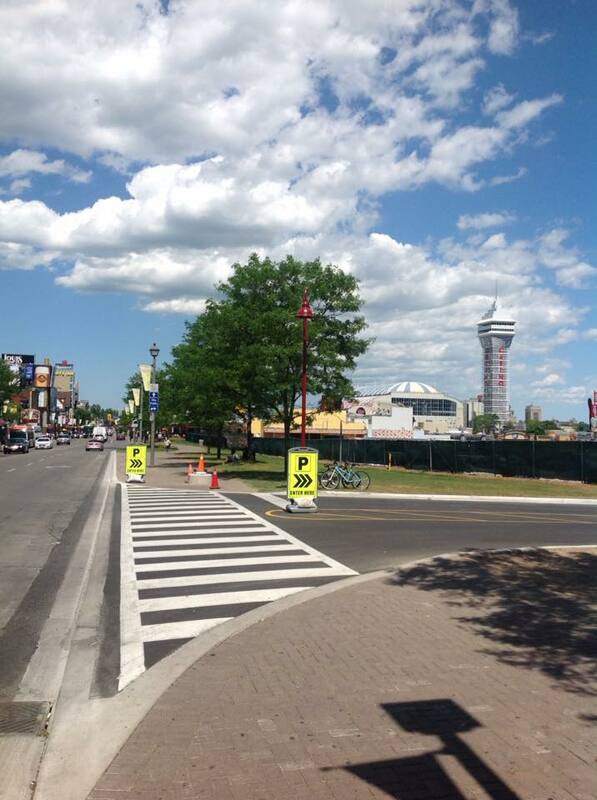 Clifton Hill Offers the easiest and most accessible place to find parking in Niagara Falls - just 1 Block to the Falls. Depending on the time of year, many visitors descend upon the Niagara Falls area to take in the Falls and all the surrounding attractions and events. Yet, you needen't struggle to find parking with the enormous parking area, spanning the two Casinos, in the middle of it all -- On Clifton Hill! A short walk from the Fallsview Casino and their adjoining restaurants, and it comes complete with a jolly cut that allows you to bypass crowds and get from the parking lot to the Queen Victoria Park and Falls in a matter of seconds! Queen Victoria Park is where you need to be to view the Falls, access the Hornblower Niagara Cruises and to watch the Niagara Falls fireworks shows. Take QEW toward East Hamilton/Niagara/Fort Erie. -Keep left to take Hwy 420 E via exit 30A toward The Falls/Niagara Falls U.S.A. -Take Stanley Ave/RR-102 towards "Alternate To Falls". -Turn left onto Victoria Av. -On the right hand side you will find our parking lot with plenty of parking (across from the Imperial Hotel and adjacent to the Niagara SkyWheel). Take I-190 N/New York State Thruway toward Peace Bridge/Ft. Erie, Canada. -Take exit 9 towards the Peace Bridge. -left onto Peace Bridge Plz/Peace Bridge. -Peace Bridge becomes QEW. -Marge onto Hwy 420 E via exit 30 towards Niagara Falls/Niagara Falls U.S.A. -Take Stanley Av./RR-102 towards "Alternate to the Falls". -Turn left onto Victoria Av. -On the right hand side you will find our parking lot with plenty of parking (across from the Imperial Hotel and adjacent to the Niagara SkyWheel). Park in the Center of the Entertainment District!